I stole some tomatoes from my parents garden when they weren't home. Oh yeah - my mom reads my blog - busted! You see....I was in a salsa kind of mood and I already had the jalapeno peppers from my own container garden and I had the onion (from a previous theft - ha ha) and why pay for tomatoes when your own parents have a million of them. Seriously....they do! 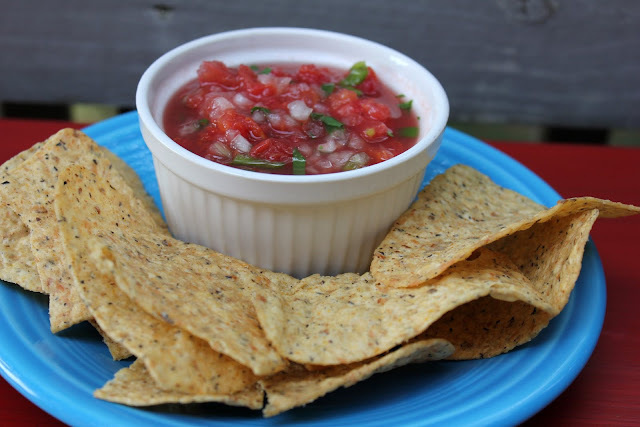 Anyway, I took my stolen goods and made some awesome salsa. Place in the fridge for at least one hour for the flavors to combine. Serve with multi-grain tortilla chips - yum! Note - To easily peel tomatoes, place them in boiling water for about 20-30 seconds and then put them in ice water for a few seconds more. The skin peels right off. To remove the seeds, cut the tomato in half and give it a little squeeze over the sink. Then scoop out the rest with a spoon. You're mom probably didn't even notice the missing tomatoes! I had plans for dozens of batches of homemade salsa this summer, but my tomato plants have not done very well. I guess a trip to the Farmer's Market is in order!